Calving Ease...All cattlemen agree, more live calves at birth means more calves at weaning. Shorthorn cross females calve unassisted 98% of the time. Shorthorn calves average 85 pounds at birth; therefore reasonable birth weights result in calves having a higher potential for growth. Fertility...Iowa State University research has stressed that reproductive efficiency is 100 times more important to economical viability than selection for carcass traits. Shorthorn bulls are aggressive breeders, and are an ideal selection for use in rotational crossbreeding programs for high conception rates with minimal maintenance. 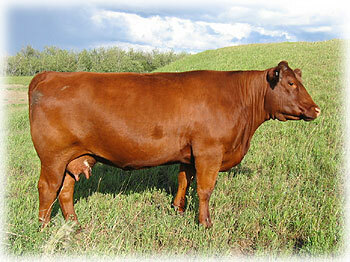 Shorthorn heifers have proved to be among the earliest to reach puberty at 359 days. 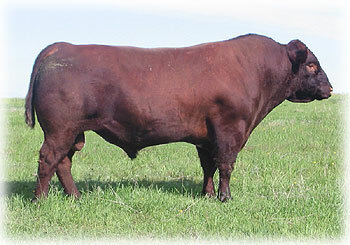 Shorthorn bulls and females readily transmit the ability to grow quickly and efficiently. At the Poundmaker Feedlot, Lanigan, Saskatchewan, 70 Shorthorn steers posted an average daily gain of 3.69 pounds. More impressive was their feed conversion rate of 6.92 pounds of feed per pound of gain. That's effective, efficient production! In a recent Cargill "Beefworks" project, 290 Shorthorn sired steers had an average yield of 60.52%, AAA grade of 53.1% and an average daily gain of 3.0 lbs./day, with a feed conversion of 6.5 lbs. dry matter/lb. gain. A premium of $9 per hundred weight was received on the AAA steers over those grading A. This amounts to nearly $7000 extra for every 100 steers making the AAA grade. 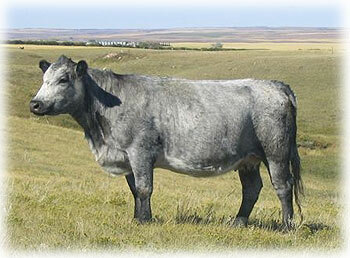 Crossbreeding...increases productivity through enhanced levels of performance for particular traits due to heterosis. Specifically, crossbreeding with Shorthorn cattle offers increased calving ease, docility, fertility, growth and carcass quality.